Dealers need to deliver the kind of online experience that consumers have grown to expect from other industries outside automotive. 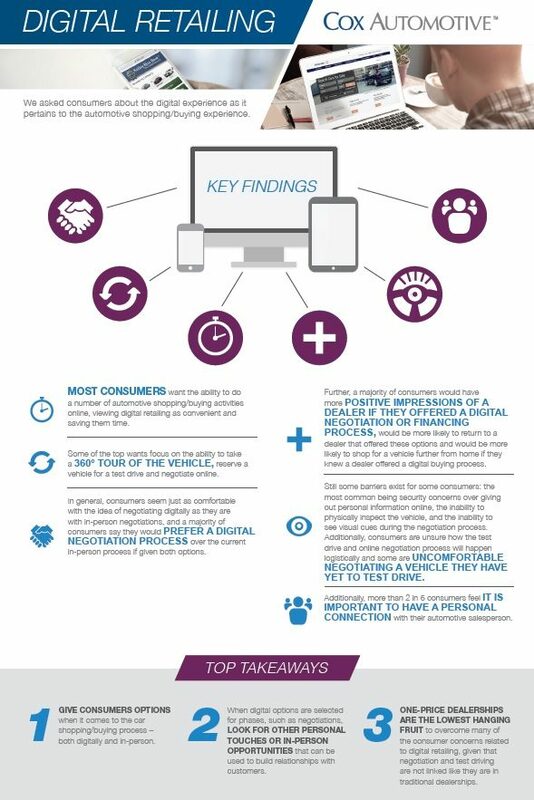 Digital Retailing offers a digital experience that meets consumer expectations while allowing dealers to maintain control of the deal. Car buyer satisfaction experiences decline the longer a consumer is at the dealership – with a dramatic drop-off after the initial 90 minutes. One way to complete the transaction under the 90-minute threshold is to allow consumers the ability to accomplish more car buying/shopping processes before they even set foot in the dealership. The F&I office experience at the dealership is a primary source of frustration for consumers. Yet, 8 out of 10 shoppers want to learn about F&I before they visit the dealership, which actually improves likelihood to purchase and can decrease time spent in the dealership. According to the 2017 Cox Automotive Digital Retailing Study, nearly all consumers (98%) want the ability to do at least some piece of the car shopping/buying process online, suggesting that dealers should incorporate at least some aspect of digital retailing into their offerings. In this video, Isabelle Helms, Vice President of Research & Market Intelligence at Cox Automotive, talks about what we can do to improve the consumer experience at the dealership and before they even set foot in the store.